Document IDs are new in SharePoint 2010. By enabling the site collection scoped “Document ID Service” feature unique IDs will be added to all documents within the site collection. When the feature is activated a custom prefix is generated that is unique to the site collection. As a site owner you can change the prefix, however you have to make sure that the prefix is unique. The document ID format is [prefix]-[0-9]-[0-9] and SharePoint will simply start numbering at 0-0, which means that using the same prefix in two site collections will definitely get you duplicate document IDs. To see the document ID for a document choose View properties for that document, or add the document ID column to a list view. After activating the feature there are two document ID timer jobs that will have to run in order for IDs to be assigned to documents. The same is true if you decide to change the document ID prefix for a site collection. The timer jobs are the “Document ID Enable/Disable job” and the “Document ID Assignment job”. Both jobs are targeted at a specific web application and by default they both run once a day. If you move a document around in your environment, even if you move it to another site collection, the document ID will stay the same. A copy operation will of course create a new document ID, as it creates a new document as well. In order to move a document to another site collection you will have to use the Content Organizer feature. Downloading a document to your computer and uploading it again into SharePoint will generate a new document ID. Document IDs only work on documents and on document sets, they don’t work on pages and list items.When searching for a document ID from anywhere in the farm SharePoint will always directly open the document for you. This means that you don’t have to remember where a document is stored and you don’t have to remember the complete url, if you know what the document ID of your document is you can always find your document within your farm. There is one thing that I ran into while using the document ID static url. The url of the web application that you are using seems to have to be in your trusted sites in order for the document to open correctly. If it’s not then Office will open the document, but it won’t remember where the document was opened from. I won’t get the pop up asking me whether I want to open the document in Read-Only mode or Edit mode, but instead I’m asked whether I want to open or save the document. 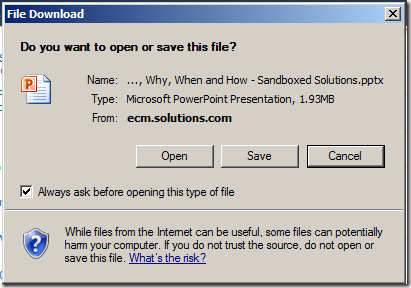 Depending on what version of Office you are using it will open the document as a read-only document, or it might open it from a temp location. This means that when saving the document I don’t get to automatically save it as a new version of the existing document, but Office will ask me where I want to save the document, which of course can be very confusing for end users. 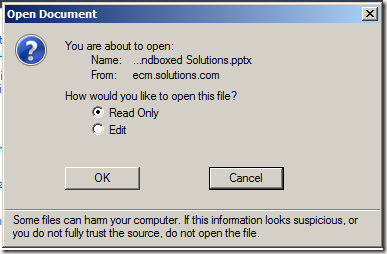 If you have your environment configured to open documents in the browser using Office Web Applications by default you won’t run into this, it only occurs when opening the document in an Office client application.